When I was growing up we had a truck camper and every summer we would drive around Newfoundland. This map is from the 70's and I remember the cover of it. We explored almost every town in Newfoundland in our camper. Posted by Karen at 7:18 p.m. I still have this map!!! 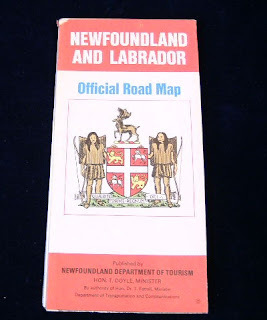 Very interesting blog, have bought a few things on ebay like old Nfld history schoolbooks that we threw out years ago, could have kicked myself later but have collected the 2-3 that I wanted! I haven't looked thru you whole blog but certainly will... Thanks for the rekindling some old childhood memories! !